Lincoln Electric Australia announces a new range of mini CNC pipe cutters delivering efficient, accurate and versatile pipe cutting in a small footprint. Lincoln Electric’s new MASTERPIPE mini profiler is an entry-level machine featuring powerful, dual-axis CNC controls to easily cut pipes or tubing of multiple lengths or diameters. 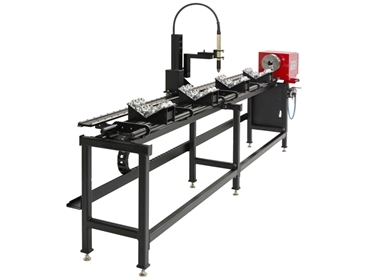 The economical CNC pipe-cutting solution improves pipe fabrication productivity and quality by consolidating set-up, programming and cutting as an easy operation. This dual-axis CNC machine has a footprint of only 2’ wide by 7’ long and can rapidly finish 4’ material. Expansion modules 5’ long can help the unit hold material up to 24’ in length. The powerful combination of a Windows computer, running Torchmate Driver software, with the Torchmate Pro-SERIES CNC controller provides effective cutting on X-Y tables. The configurable, fully editable Driver Software accepts G-code generated by design software and sends it to the controller, activating the MASTERPIPE mini profiler’s precise, accurate and dependable stepper motors to provide smooth, reliable torch carriage motion through the pairing of a direct gear-drive and self-cleaning V-rail and V-roller system. A single button control moves the torch mount back next to the chuck so that material can be easily loaded, positioned for cutting and unloaded. The MASTERPIPE mini profiler uses a variable-angle, manual height control for plasma torches. Options include an Arc Voltage Height Control (AVHC) and an oxyfuel attachment for materials with heavy wall thickness. The MASTERPIPE Mini is capable of cutting and profiling pipes with an outside diameter range of 1-8”, quickly and efficiently delivering a wide range of cuts. The optional WinMPM software enables simple menu-driven programming with operators selecting one of six types of cut options from a pre-loaded cut library, making set-up quick and trouble-free. The cuts include straight, miter, saddle, crown, elbow support and pipe to cone.